Amazon deal of the day, lowest it has been, you need to select the Silver option to get this price. Looks good to me, surprised by the cold votes. I have a delonghi bean to cup currently, and the steam function no longer works - the control dial is made of cheap plastic, and failed in just over a year. What does this do beyond the £178 Delonghi machine at argos atm (or at least it was last week). I've got the Delonghi and love it. Be aware that the Delonghi water tank and cake disposal are serviced entirely from the front ; might matter to you depending on where you intend to sit the machine. 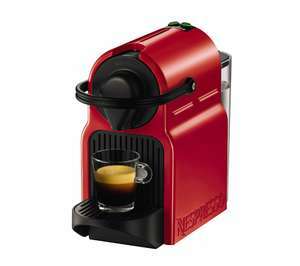 I have the older model of this machine and it makes great coffee. Never used instant since we bought it, also we don't seem to spend as much on beans as we used to spend on Gold Blend, get them mainly from Lidl and Aldi. Next cheapest is AO.com at £199. Hate pods . Drink coffee not chemicals . May be broken, I don't know, I only used one out the 3, the others were given as presents and never asked how they work. I like it cold anyway. With regards to the pods, never found more than 5 types in shops, but is also true, there is a variety on DG website. Off course it is normal to be a bit expensive, can't have both the machine and pods cheap, they need to make their money. I usually get 3 boxes for £10, sometimes cheaper alternatives such as Lidl, there were some at B&amp;M I've got once and there were rubbish. 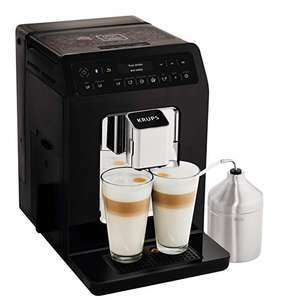 I just find Tassimo and other having more variety and slightly cheaper, but may be me, you know every time you go for something and you can't find it, you will always see the competion:). To be honest, I think all of them at this price range are pretty similar. I think your might be broken my coffee come out really hot I have to wait for it cool down. As the pods their is a lot of choice they have about 30 different types just the super market wont stock them all. 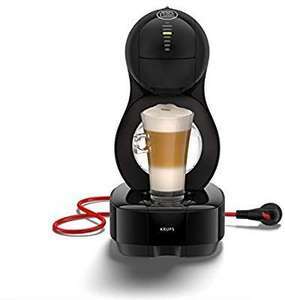 Try the Dolce Gusto site to see the range they do. As the price tell em about it then again most of these pod systems are expensive thats how they make the money. Pound save had them cheap or BM at times. Failing that you can normally get 3 boxes for 10 pounds on amazon or buy in bulk pods from some sellers. Finally a price in line with its real cost. There were lots of deals on this machines, most claiming massive discounts. I've purchased 3 of these (2 for presents), all at different times and not looking for a deal, all from different sellers and I've always £35 including a voucher to claim some pods. There is no much choice in terms of pods, these are not the cheapest either. Our machine makes warm coffees, not hot. I am happy with the temperature, as I like cold drinks, but my wife needs to put it in the microwave. I believe a fair price for this should be £25-£35, no more than this. Well my compact has developed a fault after just over 3 weeks. There is a retaining spacer in the tap mechanism that for some reason seem to sheer off and fall out of the mechanism. After this the tap now feels loose when opening and is sometimes stiff to close although still usable at this time, looking on the Facebook sub group this seems to be a common fault.looks like I’ll have to contact Heineken and see if a replacement is needed and if so I miggg ask to upgrade to the full sized Sub as a precaution. Did you get a full refund even tho you had used it? Easy...get rid of the wife and buy as many beer machines as you wish. I used the student 15 and only paid £24.99! Thanks. Does this come with the travel accessories ( cup , pod holder and 16x pods)? In the details it looks like it does . But in the description it doesn't mention it. I’m returning the Currys deal and I have ordered this one. Seriously... WHY? Indeed. If I hadn't just paid more for a pod machine from Currys (a HOT deal from here) I'd be all over this.